Today my wife Kasi and I are leaving for our honeymoon. We spent our second summer together hiking the Pacific Crest Trail, from Mexico to Canada. After a trip like that you might guess that we are not going to spend our honeymoon riding around in a tour bus. We will be spending the next month trekking in Nepal, first around Manaslu, then on the famed Anapurna Circuit. In the years since hiking the Pacific Crest Trail, one thing has changed significantly in the world of long distance hiking – digital mapping. For this trek I will be exclusively using Gaia GPS for maps. For the last few years an iPhone has been my device of choice, but having recently completed a full rewrite of Gaia GPS for Android, I figured I had better use an Android. And what better way to test a new app than a month long trek on another continent, so for this trip I am leaving my iPhone 5 at home and bringing a Google Nexus 4. The two treks combined are 300 miles of hiking, and almost 70,000 feet of climbing. Each trek goes over a 5000 meter pass. The first step in preparing to use Gaia GPS for this trip was to find GPS tracks in gpx format for the trails we will be trekking, and I was able to find several different gpx files for both. After downloading all of the tracks on to my phone, I loaded them into Gaia GPS, compared them to find the most accurate, and deleted the rest. After getting the tracks loaded I shared them with GaiaCloud so friends and family could see where we are going. Check out the Manaslu Circuit and the Anapurna Circuit on Gaia Cloud. Next it was time to download maps. My map of choice for this trip is Open Cycle Map, a topo map based on OpenStreetMap. Due to the U shape of our route, I downloaded the map in several sections, to save on storage space by not downloading areas that are not directly along the trail. In Gaia GPS for iPhone, I could have used the “download maps along track” feature to get just the maps I needed, but this feature has not yet made it to Android. I also downloaded street maps for Kathmandu, and satellite maps of the entire route. Between all three map types it was 600mb of storage on my Android. I will be sending back tracks, pictures and stories from the trail when internet access is available. This entry was posted in Adventures on November 5, 2013 by Andrew Johnson. 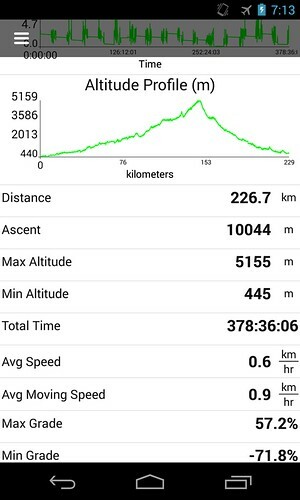 Hey Buddy!, I found this information for you: "trekking in Nepal with Gaia GPS for Android". Here is the website link: https://blog.gaiagps.com/trekking-in-nepal-with-gaia-gps-for-android/. Thank you.